Adjusting to taking medication regularly can be difficult – it can be tricky to remember to take it, to cope with its side effects and to make it part of your everyday routine. Depending on the medication, it can also be difficult to administer. Whether it’s helping you with taking your prescribed medicine, or other support you need, we can help. At Beacon Support we have a dedicated team of carers who have the experience needed for helping you with taking your prescribed medicine. We will develop a care and support program tailored to your specific needs and any conditions you are living with. We appreciate helping you with taking your prescribed medicine can be a difficult adjustment, but that you may also have other support needs. We have decades of care experience and medication knowledge we will apply when helping you with taking your prescribed medicine, so you can be assured we’re well-equipped to support you. In helping you with taking your prescribed medicine, everything we do will be carried out safely, efficiently and with as little discomfort as possible. 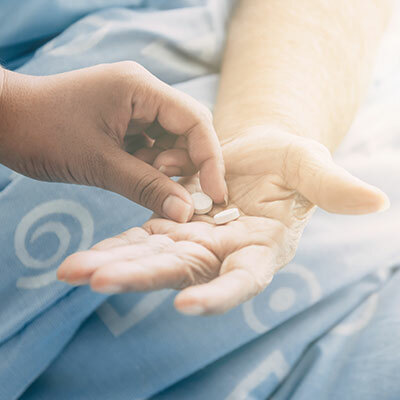 All medicine and care will be administered under the guidance of a registered nurse, to ensure medicine is taken safely and in accordance with the doctor’s instructions. In everything we do, we are focused on your individual situation, and any other conditions you may be living with. Our medication administration support and care plans can help you with everyday activities that are too difficult to manage alone. Whatever the symptoms, difficulties or conditions you may be living with, we are ready to help you and can coordinate with other services if required. One of the things we are proudest of at Beacon Support is our commitment to delivering care and support you can trust. In helping you with taking your prescribed medicine we are focused on ensuring you feel safe and supported at all times. Regardless of the situation, we know what to do and will approach all of your care professionally and with empathy. Your medication administration support will be provided under the supervision of a Registered Nurse. We are also a registered NDIS provider. Call us today at 1300 435 782 or contact us via our online form for a consultation or to learn more about administering of medication support and other services we can deliver in your home.